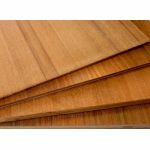 Teak veneer plywood generally does not qualify as being a true "marine grade.” That said, our teak plywood is a high-quality exterior-grade sheet laminated with a surface veneer of FEQ teak that's very suitable for marine cabinetry, table tops, teak accessories and the like -- so long as your end product will not be exposed directly to the elements. And for finishing sawn plywood edges, we also offer 3' long solid teak veneer edge-banding strips that we mill up here in our shop. They're available in 1/16" or 1/8" thicknesses, and in 1/2", 3/4" or 7/8" widths.